In 1997, I was a year out of college. A buddy and I moved in together to a cheap apartment as we were both on entry level jobs that also had entry level salaries. One of the luxuries I allowed myself was a new TV. For the times, it was a pretty awesome TV. It was a 32″ Toshiba, that’s about all I know now, though at the time I probably could have told you more specifics. Compared to what’s out now, it’s pretty basic. It only has one set of inputs for an auxiliary connection, so we have to unplug and re-plug in stuff anytime we want to switch between the DVD player and the Wii. But, that was probably pretty common then? I remember being really proud of that purchase back then. It was sort of a status symbol thing. 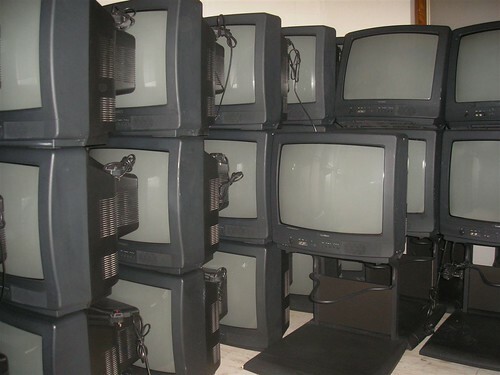 A lot of my friends had moved out on their own and no one had a TV over 30″ at the time. And at $800 or so, that was huge money for a guy not making too much money. Nowadays, of course, that TV is pretty antiquated. 32″ is nothing. I don’t think they even sell tube TVs that small anymore. And even the most basic TV has a whole row of inputs. Still, I’d always said that I planned on keeping that TV for as long as it works. So far, that’s held true. It’s been tempting to replace it with a flat screen. Especially when I watch some of the NFL football games on our flat screen (also a 32″) in our bedroom with HD. Sports, as it turns out, were meant to be watched in HD! But, as soon as I go back down to the old TV, I’m fine with what I see. And so far, the TV is holding out strong. There was a false alarm a few months ago when the bottom of the screen had some strange colors, but a quick Google search told me that something magnetized had probably been placed near it, and it just needed to be power cycled to degauss it. Worked. Do you have any stuff that you put a keep-it-til-it-dies policy on? Your post was very timely. We also have a standard TV (36 inch) that works fine. However, the sales of flat screens do cause me to look and consider. After reading your post, I will once again back away from the advertisements and go on with my day. If power cycling doesn't fix it you can actually get a demagnetizer off ebay (or use a powerful magnet) and 'drag' the distortion off the screen. You'll see what I mean if it comes back. We had a screen that picked up distortion during a lightning storm… for a few months we had purple distortion we couldn't remove. Eventually we went to a flat screen… nothing has acted up since then! My cars were (17 & 15 years old) in that category, but I am stating to think of replacement for the oldest soon. I usually wait until things break or wear out for replacement. At my house we have a long list of things that are on the KITIDs policy. TV's are at the top of the list-and always will be. We keep our cars as long as possible – the last three cars we owned we drove to the junk yard on their last legs. We have a TV that is about 13 years old and a complete mostrosity. It is working though so it stays – I hope that by the time it breaks we could have a 3D system or an implant behind the ear. Seriously considering applying the same rules to most things electric and electronic.